As a marketing strategist, you might feel like you’ve tried every tactic–including content marketing. While there are several content marketing tips out there, it can be challenging to know what advice to follow, especially if you don’t see yourself as a Hemingway type. Producing great content takes some creativity, but this doesn’t necessarily mean that everything on your blog should be fit for The New Yorker. Since 2013, digital media intake spiked by nearly 50%, which suggests more people are turning to online resources. Making it even more essential that your content feel fresh, innovative, reputable and easy to digest. Content marketing strategies have to balance between creativity and marketability. This can be tough because it’s not easy being creative when you know you have a return on investment to expect as well. Even though there’s no set-in-stone guidelines, there are some content marketing tips you should keep in your pocket. Below are our top 10. There’s no way around it–confusing and longwinded content is hard to digest. You want your target audience to know you’re honing in on them and the less clear you are, the more likely they’ll ignore what you have to say. By being clear and concise with your messaging, you’re taking the time to develop content that your audience will appreciate and respond to. At the same time, you can’t put too many ideas on your plate and expect to succeed. Kevin Cain, a content marketing and communications strategist, told Orbit Media Studios that you have to make your way through the noise of the Internet and single in on a target audience so your content gets people to act. Strategize with your marketing team on what types of content will likely perform best with your company’s target audience. Then spend the necessary time and resources on figuring out what subject matters will be have the greatest impact on your core followers. The clearer you are with your content, the more your message will resonate. Always be consistent with your content marketing strategy. Whether you’re a marketer or content writer, try to ensure the voice of each article is consistent. It can be very jarring to read an article that has the tone of an influencer in your industry, but is then followed by a nonchalant blog post. If you’re familiar with Groupon’s brand voice, it’s steadily humorous across all channels. Consistent content helps readers flow from one post to the next. Search engine optimization isn’t just a buzzword. SEO can make or break your entire content marketing strategy. Initially, SEO was complex and complicated for marketers to implement. Now, with the way we search for information on Google, Bing and Yahoo, SEO is accessible and critical to your marketing strategy. Use strong keywords: Keywords are critical to growing your audience. Use keyword search tools such as Keywordtool.io, SEMrush or Google AdWords to find out what words are searched the most in your industry. Once you have those keywords, use them in your content’s title, body and meta descriptions so Google can find and evaluate your work more easily. Remember: don’t cram dozens of keywords into your content or you’ll run the risk of your site being banned or penalized. Include ALT text: Just like the text in your content, images can be optimized as well. Alt should be extremely clear and descriptive so search engines can match your content with your images. Additionally, ALT text is used for those with vision impairments reading your blog, so don’t put in massive descriptions or anything you wouldn’t want your audience to read. You’d be surprised what you find in ALT text sometimes. Add outbound links: To truly optimize your content, every article should have links to other credible sources. These sites should be authoritative and have high domain authorities. Use tools like Moz to check website DA’s so you can easily determine website rankings. Link to internal pages: While outbound links are essential, so are internal links. This helps keep visitors on your site for longer periods of time and shows your audience that you’re a reliable source for multiple topics. Set outbound links to open in a new tab or window, but have your internal links go directly to the source. A lot of marketers can overlook the more creative strategies in content, but that’s why you hire great writers. When your content has a unique voice that others in the industry will recognize, you know you have quality writers working for you. The words on your blog are what make your company and you should never differentiate the voice of your blog and the overall company. By telling better stories, you’re able to engage, entice and spark conversation with your audience. Your content management strategy should absolutely focus on getting readers talking about your brand. Fantastic writing and storytelling will put you ahead of the pack when it comes to your competition. If you put a small budget on your content strategy, you’re likely going to get what you paid for. Instead, focus on hiring writers you know can not only match your company’s voice, but also push readers to actually spend time with the content. Roughly 80% of CMOs believe future marketing trends point to custom content. About 70% of B2B marketers demand content across all channels including social media. 94% of social media marketing content is derived of original written content. 92% of marketers feel social media is critical to business operations. Now more than ever, social media is growing in discussion in content marketing planning. People continue to turn to Twitter, Facebook, Instagram and even newcomers like Snapchat for fresh content. You have to make the most of social media by keeping a pulse of what’s being said about your company and how you can further engage those people. There’s a reason why listicle articles have gained so much popularity–they’re easy on the eyes. You have to keep things visual for your audience so they’re locked into your content. According to a Social Media Examiner report, 19% of businesses believed original visual assets were the most important form of content. You want a consistent flow in your articles and images, quotes, surveys and other visual media can break up blocks of text that seem overwhelming when put together. Nothing is more boring than a blog that only has text. Even 500 words can seem daunting when there’s no visual flow. When companies are visual with their content marketing, readers stay on sites longer, click to more internal links and often plan to come back. All of this leads to higher chances of people buying your product or service. It’s no secret–brands lurk competitors all the time to see what they’re doing successfully. Monitoring your competitors is a great way to stay on top of industry trends and to see what made certain content so successful. This isn’t to say that your brand should steal its content marketing ideas from competitors. There’s a major difference between keeping your ear to the ground and following the leader. Try your best to see what competitors are doing and use their methods to improve and adjust your own content. Easier said than done, right? Still, it’s always important to understand what resonates well with your audience and monitoring other blogs, social media posts and company newsletters can give you a better idea on how to engage successfully. Whether it’s a question or a complaint, you have to listen to your customers. This plays a vital role in your content creation because listening to your customers on social media will give you new content ideas for your blog or social networks. It can be difficult to manage all of your social media channels at once for content creation purposes. 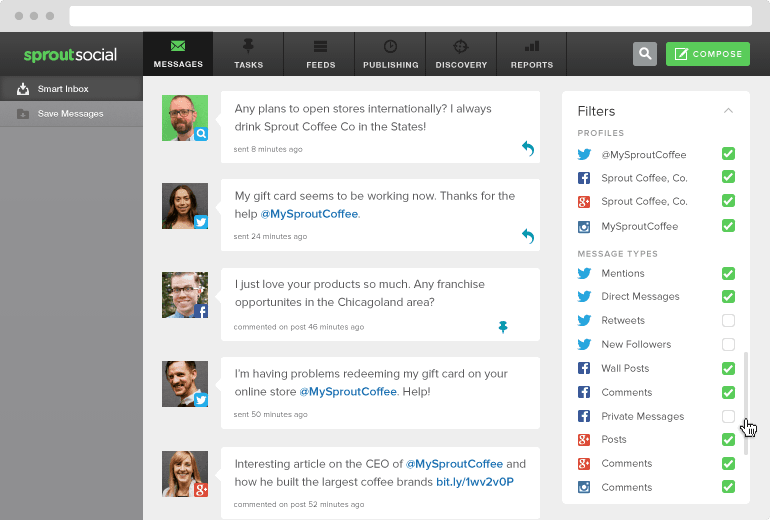 Sprout Social makes it easy to see what questions or complaints your audience has through a single-stream platform. Take control of your social engagement by using Sprout’s keyword monitoring tools. This will help you manage networks like Twitter, no matter if it’s an @mention, hashtag or just a conversation with your business’s name. Part of your content marketing strategy should include revisiting and repurposing old content. From a SEO perspective, this can help enhance your content’s ranking on search engines. As your content strategy evolves, beefing up older posts to resonate with your new strategy can help cut content creation costs. Just remember to make sure your repurposed content is still in the same voice as your brand. Start with old blog posts that don’t match your current business status. Use tools like BuzzSumo to see how well your content is doing across each social channel. Once all of your content aligns with your existing strategy, go back and revise your best performing content. It’s sad but true–your blog will not be an overnight success. Blogging and content creation takes serious time and effort from writers, marketers and SEO experts. You need to simply let your content breathe before you make any rash decisions. However, there are ways to help get some quicker results. The more you build a catalog of content, the likelier you’ll see engagement with your brand in these marketing channels. By following these tips, you’ll easily pave your future of content marketing. Do you have content marketing tips? Post your thoughts below in the comments!